United States President Donald Trump’s desire to put “America first” has fostered new disputes between the US and its allies. In Asia, old rivalries are also roaring back. Ties between Japan and South Koreatwo of the US’ closest security partnershave arguably turned their most hostile in more than half a century over a series of diplomatic disputes. Now, there are signs that the feud, fuelled by disagreements over Japan’s colonisation of the Korean peninsula decades ago, is beginning to damage economic and military relations between the neighbours. During previous nationalistic flare-ups, US administrations normally intervened to make sure such grudges do not spin out of control. Not any more. The episode in North Asia illustrates how Trump’s scepticism of traditional US alliances and preoccupation with a rolling series of political crises in Washington may be quietly reshaping the post-war geopolitical landscape. While ties between Japan and South Korea run deepeach is the other’s third-largest trading partnerthey are laden with centuries of grievances, especially Tokyo’s 1910-45 colonisation of the peninsula. Disputes over whether Japan has sufficiently atoned for its actions returned to the fore after Moon Jae-in won the South Korean presidency in 2017 and pushed back against Japanese prime minister Shinzo Abe’s efforts to put the war disputes to rest. Perhaps most consequential to the US is the deteriorating ties between the Japanese and South Korean militariessomething that could undermine American efforts to counter a rising China. Both defence ministries have accused each other of endangering their personnel after Japan said a South Korean naval vessel used a weapons-targeting radar on one of its military planes in December. 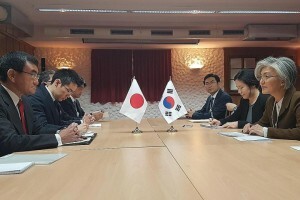 Kyodo News and other media have said defence exchanges are being postponed, increasing the potential for misunderstanding during unplanned encounters. But neither Abe nor Moon has much domestic incentive to settle, with nationalist sentiments running high. In the past, the US has used its leverage as chief security guarantor to keep the rivalry in check, helping to broker their 1965 treaty, despite domestic opposition on both sides. Trump, however, has shown little interest in the alliance since abandoning his military pressure campaign against North Korea last year, focusing instead on US trade deficits and military expenditures with both countries. The US leader skipped a pair of Asian summits in November to focus on the midterm elections and did not hold a trilateral meeting with Abe and Moon at the subsequent Group of 20 gathering in Argentina.